In the months before the UN vote to partition Palestine into Arab and Jewish states in November 1947, the Jewish Agency leadership there had to overcome a series of foreign policy obstacles working against the Jewish state’s establishment. Thus, little time was devoted to writing Israel’s Declaration of Independence. Evolving a declaration was put off until a month before the state was declared on May 15, 1948. Pressing political and strategic matters prevailed. At the United Nations, before the partition vote, Jewish Agency diplomats lobbied feverishly to obtain first the UN proposal to suggest a two-state solution, and then again the necessary two-thirds majority (33-13 with 10 abstentions) in favor of partition. Almost immediately, the British and Americans colluded to try to reverse the partition vote, seeking to maintain control of Palestine through a trusteeship. Having either the British or Americans take control of Palestine in some form of trusteeship would have overturned the partition’s vote for a Jewish state. Zionists in America worked as hard to have a majority vote on partition taken as they did to keep it from being reversed. In late spring 1948, Britain took the view that its troops could not be expected to enforce the partition resolution against the will of its Arab allies or the Arabs in Palestine. 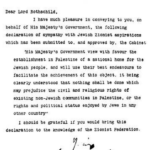 London told its military leaders in Palestine to hand over bases, equipment, and road crossings to Arab irregulars. Some of the fiercest fighting in the coming war took place at where the British turned over strategic assets to Arab fighters. In early 1948, The US State Department actively sought to delay the creation of the Jewish state, believing that the small Jewish armies would go down to quick defeat at the hands of hostile Arab neighbors. The highest-ranking members of the State Department feared that devastating Jewish military loses would mean having to send as many as 50,000 American troops to rescue the Jewish population, and that in turn could spawn a Soviet intrusion into the Middle East. This would put Washington and Moscow on an inevitable collision course. Though Truman recognized Israel within minutes of its statehood declaration, it took the State Department until the end of June 1948 to come to the realization that the Jewish state would survive. Zionist efforts to engage in some sort of diplomatic compromise with Arab leaders failed. In September 1947, two months before the partition resolution passed, Azzam Pasha, the head of the Arab League said no to members of the Jewish Agency who were seeking a two-state compromise. By January 1948, the newly formed Arab Liberation Army attacked northern Jewish settlements at Dan and Kfar Szold. Golda Myerson (Meir), a key member of the Jewish Agency’s foreign affairs team, tried unsuccessfully to persuade Jordan’s King Abdullah not to join the fight with Israel. Brutal clashes between Jewish and Arab forced continued until 1949 when armistice agreements were signed between Israel and four neighboring Arab states. No agreement was signed with a Palestinian delegation because in part the Arab League would not allow them to be represented in talks with Israel. Reasons for Palestinian losses and flight from Palestine as well as those for Zionist successes are well documented by authoritative Palestinian writers and reputable Israeli observers, including Yigal Allon. Diplomatic and military issues preoccupied Jewish leaders in the half year before statehood. Final decisions about the state’s name, the capital, and the final wording of the DOI were put off until April-May. Ten members of the Provisional Government of the new state, led by David Ben-Gurion decided to go forward with the decision made a month earlier by the Zionist Executive Council, the highest body of the Zionist Organization to declare independence as of May 15. Moshe Shertok (Sharett), who served as head of the political section of the Jewish Agency was the primary author of the declaration’s first draft. It recounted Jewish and Zionist history and relied on the American Declaration of Independence and Constitution for conceptual and language guidance. Ben-Gurion reportedly secured a safe deposit box at a bank in Tel Aviv before reading the declaration at 4 p.m. Friday May 14, so that the original document could be immediately placed there for safekeeping during the expected Egyptian air force bombing of the city. The Israeli Declaration of Independence is divided into four parts, explaining the historical and international legal case for the existence of a Jewish state in the Land of Israel, the self-evident right of the Jewish people to claim sovereignty, the actual declaration of statehood, and statements about how the state would provide for citizen rights. Comparisons of the American and Israeli independence declarations are instructive. Both of them assert the right to control their own destinies and be free of despotic abuses. Both proclaim the importance of liberty and freedom, stating them as basic human and natural rights. Both promise safe-guards for the individual, and state the objective to foster economic well-being. Both say nothing about national borders. Unlike the American DOI, the Israeli DOI proclaims its legitimacy to sovereignty from actions by international organizations, namely the League of Nations and a United Nations General Assembly majority vote in November 1947. No such organizations of course existed in 1776. Where there were skirmishes going on between Americans and the British when the American DOI was signed, when Israel declared its independence it was in the midst of a full-fledged war for survival with the local Arab population and surrounding Arab countries. Unlike the American declaration, the Israeli declaration sites historical benchmarks linking the people who are claiming independence to earlier sovereignties. The Israeli declaration appeals to Diaspora Jews for support and encourages immigration to Israel. Later, when a constitution was not ratified, the phrase “guaranteeing freedom of religion, conscience, language, education and culture” became the foundation for protected civil liberties in Israel. Civil rights were later stipulated in Israel’s Basic Laws. Eight hours after Ben-Gurion read the declaration, the Egyptian planes dropped their first bombs on the outskirts of Tel Aviv. Zionist state builders and Israeli political leaders had for half a century kept their eyes on the prize.